Auctioneer James Morton said this third sale in as many days, which together had raised a total just short of GBP 2 million, was a great finale to an exceptional year for Morton & Eden. Once again it was dominated by Russian Orders, notably the Napoleonic War and Order of St George group of five, which exceeded all expectations to sell for GBP 72,000. 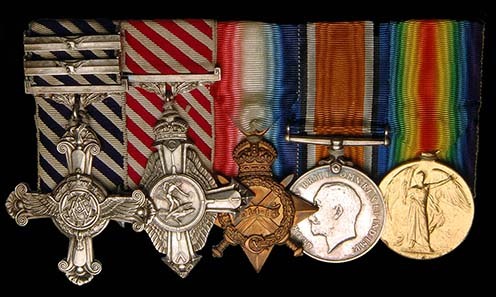 The sale also proved there is still strong demand for outstanding British gallantry awards, the GBP 36,000 achieved for the Great War triple DFC group indicating that medals with great provenance always sell at a premium. However, buying was more selective in a section of Chinese Orders and Medals, a market which remains esoteric. Overall, fine quality material that is fresh to the market continues to attract top prices, despite difficult global economic times. Lot 1241: A Good Napoleonic War and later Order of St George Group of Five, mounted for wear European-style on curved bar-brooch suspension and comprising: Order of St George, breast badge for 25 Years Service, in gold and enamels, dated 1845, probably by Dmitry Andreev, St Petersburg, width 37.5 mm, slight flaking to white enamel in two places, otherwise extremely fine; Silver Medal in Memory of the War of 1812, on St Andrew ribbon [now detached], extremely fine; Silver Medal for the Taking of Paris, 1814, on combined St Andrew and St George ribbon, extremely fine; Bronze Medal in Memory of the War of 1812, on St Vladimir ribbon, edge bruise, about extremely fine; and France, Légion d’Honneur, Officer’s breast badge in gold and enamels, Second Restoration Issue (1815-1830), good extremely fine (5). Estimated: GBP 30,000-40,000. Realized: GBP 72,000 (88,390 Euro, $112,995). Lot 1238: Case: Order of St Andrew, an original case for a sash badge and bullion star, circa 1840, with goldblocked red morocco lid, gilt-lined hinged compartment within lid and moulded velvet-covered interior to accept the badge and a star with a diameter up to 89 mm, width 175 mm. height 115 mm, depth 27 mm, minimal marks or wear, exceptionally well preserved and good extremely fine Provenance: Known to have belonged to an Austrian Archduke. Estimated: GBP 20,000-25,000. Realized: GBP 60,000 (69,958 Euro, $94,174). 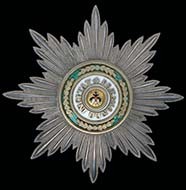 Lot 1258: Order of St Stanislaus, Civil Division, First Class, Non-Christian set of insignia, by Albert Keibel, St Petersburg, 1896-1908, comprising sash badge, in gold and enamels, 66 mm (including suspension ring) x 61.5 mm and breast star, in silver, silver-gilt and enamels, width 91 mm, very slight losses to the green enamel of wreath on the badge, generally extremely fine (2). Estimated: GBP 50,000-60,000. Realized: GBP 60,000 (69,958 Euro, $94,174). Lot 1239: Order of St Alexander Nevsky, set of insignia by Julius Keibel, St Petersburg, comprising: sash badge, in gold and enamels, marked beneath red enamel and on reverse of suspension ring (but not dated), width 55.6 mm; and breast star, in silver, silver-gilt and enamels, width 88.5 mm, traces of wear, extremely fine, with modern sash (lot). Estimated: GBP 40,000-50,000. Realized: GBP 55,000 (64,136 Euro, $86,396). Lot 1257: Order of St Anne, medal for foreign recipients, in gold and red enamel, by Eduard, St Petersburg, 1908-17, 40.5 x 27.5 mm, extremely fine, in fitted case of issue, with riband. Estimated: GBP 20,000-25,000. Realized: GBP 50,400 (58,764 Euro, $79,155). Lot 1478: The Arnhem D.C.M. Group of Eight awarded to R.S.M. (later Captain) Robert Dennis Gay, Grenadier Guards, attached 156th Battalion the Parachute Regiment, Army Air Corps, comprising: Distinguished Conduct Medal, George VI type 1 (2613715 W.O. Cl. 1. R.D. Gay. A.A.C. 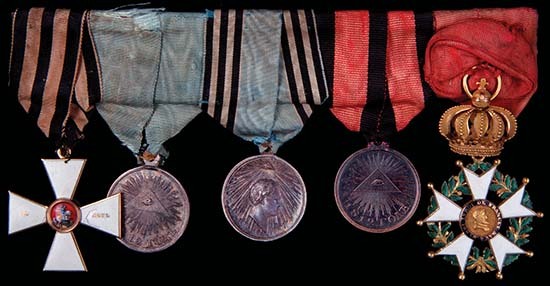 ); 1939-45, Italy, France and Germany Stars, Defence Medal, War Medal, with oak leaf for Mention in Despatches; General Service Medal, 1 clasp, Palestine 1945-48 (Lt. R.D. Gay. D.C.M. A.A.C), mounted for wearing, good very fine (8). Estimated: GBP 20,000-30,000. Realized: GBP 45,600 (53,172 Euro, $71,612). Robert Dennis Gay joined the 156th Battalion of the 4 Parachute Regiment in June 1943 soon after its formation, as its new Regimental Sergeant-Major. He had joined the Grenadier Guards 10 years earlier upon leaving school. He rapidly established his personal reputation by taking part in a boxing competition in which he defeated all those who grasped the opportunity to ‘take a crack’ at the Sergeant-Major; he had been champion of his previous regiment. The Battalion served in Italy during the summer of 1943 before returning to England. It would next see action as part of Operation Market Garden at the Battle of Arnhem. Gay and the 156th were dropped west of Arnhem on Monday 18 September 1944 and by nightfall had marched to within four and a half miles of the city, where they were halted by enemy fire. The enemy was too strong for a night attack and so the battalion retired a mile back. At dawn the next day they resumed their attack and discovered that the position where they had been halted the previous night had been abandoned by the enemy, so that the ground was taken without a shot being fired. C Company then went into reserve as A and B Companies began their ill-fated attack on the blocking line along the Dreijenseweg. C Company held their positions for much of Tuesday, but eventually were ordered to withdraw south of the railway line. In the confusion of a hasty, though perfectly orderly withdrawal, a large portion of the 156th, including one of C Company’s platoons, failed to cross the rail line at the agreed place and instead carried on towards Wolfheze; they were never seen by the battalion again. The Brigade came to a halt overnight south of the railway and C Company dug themselves into positions, but passed an uncomfortable night with persistent enemy patrols probing the defences. On the following morning the Brigade began to make its way towards the Oosterbeek Perimeter. Initially the 156th Battalion led the way and made good but cautious progress until A Company encountered solid German resistance. C Company were ordered to make an attack over their right flank, and coming on to some high ground they could see a number of German half tracks on the road below them. These were quickly dealt with, but when the Company pushed forward it was discovered that German infantry were holding a strong position on the opposite side of the road and little more progress was made. Major Powell of C Company returned to Battalion HQ to arrange for supplies to be brought forward and also to visit his commander, who ordered him to withdraw as the Battalion was preparing to push in another direction. Powell himself continued onwards to find some ammunition from R.S.M. Gay and found the latter slumped on his back against a Jeep. Being under some pressure at this time Powell demanded, “Bloody hell, can’t you get to your feet and find us the ammunition we want?” “I’m very sorry, Sir,” replied Gay, “I’ve been shot through both legs.” Feeling somewhat embarrassed, Powell collected the ammunition himself and returned to C Company. Gay was taken prisoner-of-war by the Germans shortly afterwards and was imprisoned in Stalag XIB at Fallingbostel in Lower Saxony. After his release he married and rejoined his unit, with whom he served in Norway and Palestine. He was commissioned in 1947 and ended his army career in 1949 as Adjutant, Training and Holding Battalion, Parachute Regiment. Following demobilisation he joined the British Insulated Callender’s Construction Company (BICC) as a trainee manager, beginning a highly successful new career in power cable engineering. Various reports of Gay’s award of the M.B.E. appear to be exaggerated! It is possible that the recommendation cited, which appears to date from 1943, is that for his Mention in Despatches. Photographs (6), including one with his wife at the time of his D.C.M. Investiture. Lot 1466: The Great War Triple Distinguished Flying Cross and Air Force Cross Croup of Five awarded to Squadron Leader Walter Hunt ‘Scruffy’ Longton, 85, 24 and 58 Squadrons R.A.F., late R.F.C. and Worcestershire Yeomanry, who was credited with a total of 11 kills between July and October 1918, comprising: Distinguished Flying Cross, George V, with two bars for second and third awards; Air Force Cross, George V; 1914-15 Star (2385 Pte. W.H. Longton. Worc. Yeo. ); British War Medal (Capt. W.H. Longton. R.A.F. ); and Victory Medal (Capt. W.H. Longton. R.A.F.) Good extremely fine, mounted for wearing with second type DFC and AFC ribbons, in a Selfridge & Co. card box posted to Mrs Longton on 11 March 1927 (5). Estimated: GBP 20,000-25,000. Realized: GBP 36,000 (42,037 Euro, $56,462). Second Bar to Distinguished Flying Cross: London Gazette: 3 June 1919 (General Citation). Air Force Cross: London Gazette: 3 June 1918 (General Citation). Walter Hunt Longton was born at Whiston, Lancashire on 10 September 1892. A keen motorcyclist, he worked as a car tester for the Sunbeam Motor Company before the First World War. He initially served in France with the Worcestershire Yeomanry but transferred to the Royal Flying Corps in April of 1916 as a 2nd Lieutenant. Appointed a Flying Officer the following July, he became a test pilot based in England. For his invaluable work in testing aircraft he was awarded the Air Force Cross. Following his work as a test pilot he was transferred to France to serve with 85 Squadron. On 7th of July he destroyed a Fokker DVII over Doilieu, the first of the 11 victories he was to notch up in little more than four months. He achieved a further 3 victories in July – a Hannover C on the 10, an Albatross C on the 14th and a Pfalz DIII on the 24th. The following month saw him shoot down an Albatross C on the 9th and a Fokker DVII on August 22nd the latter sortie being cited in his award of the D.F.C. On 27th September 1918 he was posted to 24 Squadron as ‘B’ Flight Commander, initially employed in tactical air reconnaissance (as noted in the citation for his bar to the D.F.C.) On 8th October he destroyed a balloon south of Busigny, and he finished October with a rush of victories, shooting down a Fokker DVII on the 14th and achieving two further successes on the 29th – a solo victory over a Fokker DVII and a reconnaissance two-seater shared with Lieutenants Harries and Friar just half an hour later. He finished his tally of victories the next day with another Fokker DVII over Marvilles. On leave between service with 85 and 24 Squadrons, Walter Hunt Longton married Lily Eleanor Miller, who was an ambulance driver, on 3 September 1918. A copy press release which accompanies the lot advertises another 1920 ‘Derby’ in which Longton was to pilot Sir John Shelley Rolls’ Sopwith Snipe, powered by a 200 h.p. B.R.2 engine. He also became the joint winner of the first Lympne Light Aircraft Trials in 1923, on the English Electric Wren, and other appearances included the 1924 King’s Cup. ‘Scruffy’ Longton was one of three pilots to be killed at the disastrous June 1927 Bournemouth Air Meeting, held at Ensbury Park only a fortnight or so after Lindbergh’s epic and widely celebrated solo Atlantic crossing in the Spirit of St Louis. The first race to be held on a blustery Bank Holiday Monday before a vast crowd was a ‘Medium Power Handicap’ for no less than twelve aircraft, with Longton’s Blackburn Bluebird starting second. The last machine to start, off scratch, was a Westland Widgeon monoplane with Westland’s test pilot Laurence Openshaw at the controls. The handicapper judged well, leading to close bunching of the machines as the race developed. Openshaw was closing on Longton (who was maintaining second or third position) when, in the words of Flight’s correspondent: ‘… disaster, swift and complete, overtook two of the pilots. From the aerodrome those who happened at the time to be looking towards one of the field turning points, suddenly saw a machine tilt over, dive and disappear behind the trees. That a collision had occurred was evident, but the distance was too great to make out the identity of the machines involved. Nor was it possible to ascertain this by noting the machines that completed the race, since several competitors, upon seeing the accident, circled around the spot, some landing and others coming back to report. One pilot, on returning to the aerodrome, expressed the opinion that the two machines were the “Bluebird” and the “Widgeon,” and after a short wait, during which ambulances were rushed to the spot, this was confirmed …’. ‘… Those who saw the earlier stages of the race will realise how very little it would take to cause a collision. A very light swerve, or dive, or climb, and disaster was threatening … ’. ‘In Longton and Openshaw we have lost not only two excellent pilots but also two extremely popular friends …’. Diana Balfour; Ruth Bonham-Carter; Sefton Brancher, describing Longton as ‘one of the best fellows and most gallant pilots in the R.A.F …’ ‘… his death will be an inseparable loss to British aviation … ’ ‘… he has done more to help Air Racing in this country than any other man’. ; F.H. England; Frederick Handley Page; Arthur Harris (later Sir Arthur ‘Bomber’ Harris, two letters, including one offering personal advice); Geoffrey de Havilland; Harold E. Perrin (Royal Aero Club); Frank Robinson (Baghdad); Philip Sassoon; Robert Saundby; and Beatrix Sopwith. 58 Squadron badge; silver clasp dated 1909; newspaper cuttings relating to various aerial events in which Longton participated; and various photographs, including one of his Memorial at R.A.F. Netherdown. Lot 1237: Order of St Andrew, breast star, in silver, silver-gilt and enamels, by Keibel, St Petersburg, before 1898, marked on the gilt backplate and brooch-pin, width 86 mm, light overall wear, good very fine. Estimated: GBP 20,000-25,000. Realized: GBP 33,600 (39,167 Euro, $52,723). Lot 1259: Order of St Stanislaus, Civil Division, Third Class, Non-Christian badge in gold and enamels, by Albert Keibel, St Petersburg, 1896-1908, 51.8 mm (including suspension ring) x 47 mm, slight overall wear, good very fine. Estimated: GBP 10,000-12,000. Realized: GBP 31,200 (36,373 Euro, $48, 969). Lot 1293: A Good Hero of the Soviet Union Group awarded to Lieutenant Gavriil Ivanovich Ignashkin, First Air Squadron 431 Ground Attack Air Regiment, comprising: Hero of the Soviet Union’s Gold Star Medal, no. 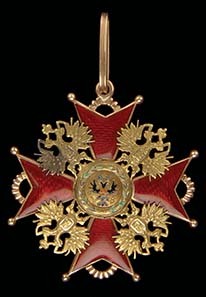 764; Order of Lenin, no. 12124, screwback suspension, screwpost shortened; Order of the Red Banner, no. 33535, screwback suspension, screwpost shortened; Order of the Red Banner, no. 222469, 5-sided suspension, solder marks at centre, apparently from an unofficial screwpost; Order of the Red Banner for 3 Awards, no. 9661, 5-sided suspension (awarded 30 12 1956); Order of Alexander Nevsky, no. 3987, with rectangular suspension (McDaniel type 1, variation 2); Order of the Patriotic War, First Class, no. 220560, screwback suspension (McDaniel type 2, variation 1); Medal for the Liberation of Warsaw Light overall wear, generally good very fine (10). Estimated: GBP 7,000-9,000. Realized: GBP 26,400 (30,775 Euro, $41,435). The group is offered with Large Size Bestowal Document for the Hero’s Gold Star, 15 December 1942, in original ink-stained cover not seriously affecting the document, original Medal Award Cards for the two medals, 3 original photographs, a McDaniel certificate for the Gold Star (graded 9/10 for condition) and typed and photocopied research, including full Order Book information and citations with full translations. For further information on Morton & Eden and future auctions, please click here.